Friends! 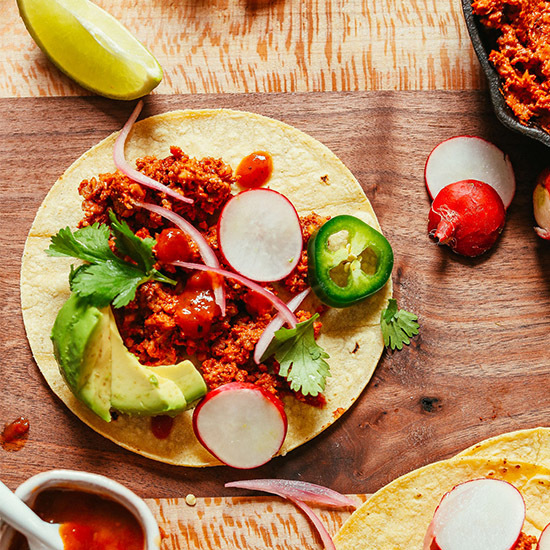 Vegan taco “meat” is here! It’s made with delicious wholesome raw ingredients and ready in 10 minutes. Let’s do this! This recipe starts with raw walnuts, which are blitzed into a fine meal. This creates the perfect texture while providing tons of healthy fat and protein. Next comes a spicy, smoky red sauce made with sun-dried tomatoes, peppers, garlic, and dry spices. 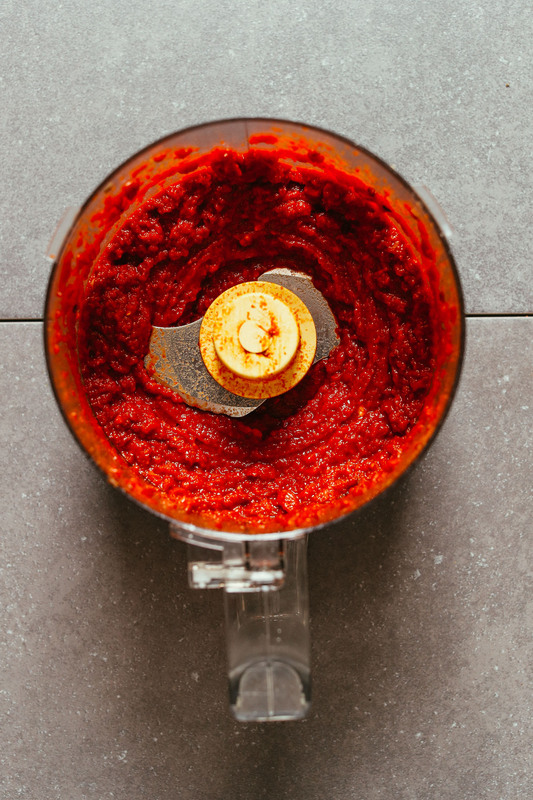 Once it’s blended into a paste, simply combine the two and – seriously – that’s it! 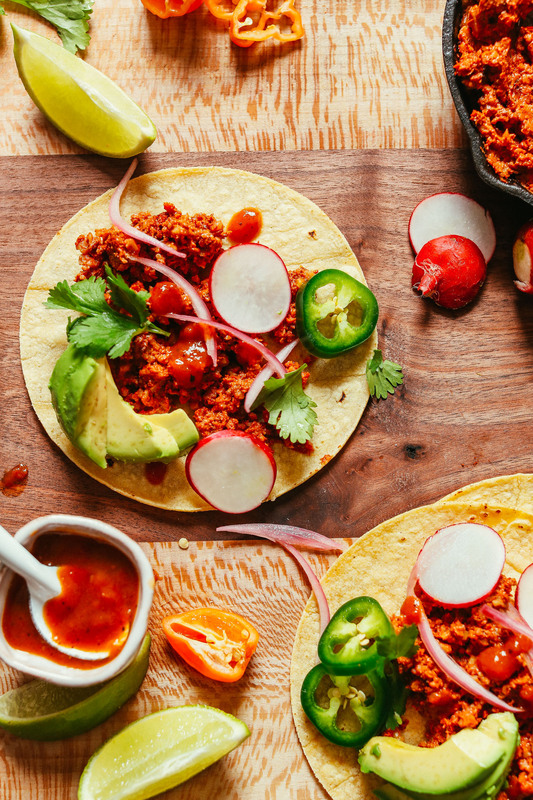 This taco “meat” is seriously dreamy! We love the slightly chunky texture, the heartiness from the sun-dried tomatoes, and the spice from fresh habanero peppers. Mmm, it’s dinner time. This would make the perfect item to add to things like tacos, burritos, nachos, salads, and more. We could also see it being a lovely addition to dishes like our Tortilla Soup, 1-Pot Lentil Chili, and Black Bean Sweet Potato Enchiladas! You could also add it to a Perfect Roasted Sweet Potato with Garlicky Guacamole, Easy Red Salsa, and a little Vegan Sour Cream for the ultimate decadent (yet healthy) meal! 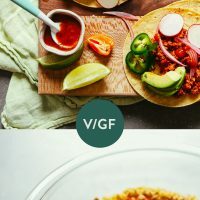 Digging vegan Mexican dishes? 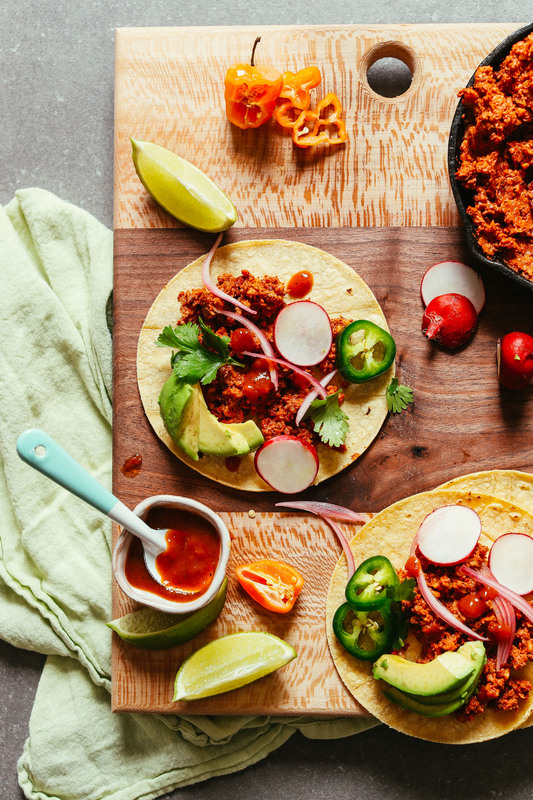 Be sure to check out our Vegan Quinoa Taco “Meat” and these 14 Vegan Mexican-Inspired Recipes! Easy, delicious, 10-minute vegan taco "meat" made with walnuts, sun-dried tomatoes, spices, and peppers! The perfect balance of spice and smokiness, and loaded with protein and healthy fats. Add to tacos, nachos, salads, and more! Add sun-dried tomatoes to a small bowl and cover with warm water. Set aside and allow to soak for at least 5 minutes. To the bowl of a food processor, add walnuts and pulse into a semi-fine meal (some larger chunks are okay. Be careful not to churn into a butter). Transfer walnuts to a medium mixing bowl and set aside. Drain the sun-dried tomatoes (reserving the water in a small bowl to add back to the sauce later on) and add to the bowl of the food processor. Add garlic, sea salt, smoked paprika, cumin, chili powder, coconut sugar, habaneros, and nutritional yeast (optional) and blend until a smooth paste is formed. Add 1 Tbsp (15 ml) of reserved water at a time until a thick but pourable sauce is formed (see photo). Taste and adjust flavor as needed, adding more salt for saltiness, garlic for more “zing,” peppers for heat, cumin for smokiness, or coconut sugar to balance the heat. Add mixture to walnuts and stir to combine. At this point, you can taste and adjust flavors as needed once more. We added a bit more salt. Enjoy in any setting one would use taco meat: tacos, salad, nachos, burritos, and more. Leftovers can be stored up to 5-7 days in the refrigerator or up to 1 month in the freezer. *If your sun-dried tomatoes are packed in oil, this will add more potentially unwanted moisture to the spice mixture. To avoid this, either pat them dry or rinse, drain, and proceed with recipe as instructed. If large, chop into small pieces. We prefer to use Trader Joe’s sun-dried tomatoes that come in a bag (not packed in oil). FANTASTIC! Absolutely fantastic! This is delicious and a really filling addition to a salad. Husband enjoyed the flavour, too. I would love to see you do more RAW VEGAN recipes as this one was epic and I love my raw food. P.S ** Every recipe of yours I have tried has been a success, no ‘flops’. We have some favourites, and some maybes, but they always work out, which is great for someone like me who’s not a ‘natural’ with creating meals. Thank you! I’ve seen a few different recipes, but this is the first one I saw with sundried tomatoes (I used a drained jar in oil as that’s what I had on hand. It worked great.) My husband mixed it in with his ground turkey taco meat and really liked it. He snuck some onto the kids’ plates also and we didn’t get any complaints! Oh, I used pecans instead of walnuts, also what I had on hand… great recipe, highly recommend! So glad to hear everyone enjoyed it, Suzanne! Thanks for the lovely review! We love this recipe! I made this to take camping last summer to make taco bowls. It stored wonderfully in the cooler and was a staple throughout the weekend. This is amazing!! Plant based and so good you could fool even the most meat-and-potato-only loving folks. Made it for a work cook-off and it was a huge hit! Served mine as a nacho appetizer – on a blue corn tortilla chip with a dice of avocado, a cilantro leaf, and a squeeze of lime. Wow so many great reviews that it took time to scroll through and read them all. I have made this 3x. We use it on salads. The 2nd time, I used 2 tblsp of curry powder, some cumin, sugar and not the other spices. Indian, Mexican versions were both amazing. I may sub out the sugar for some dates next time and may add more garlic. Very impressed with this simple, delicious recipe. This was so good! I am trying to include more raw meals into my diet— this can be hard when a ton of recipes out there include crazy ingredients that my local grocery store doesn’t carry and also cost an arm and a leg. This recipe was simple ingredients, easy to follow, and so good! 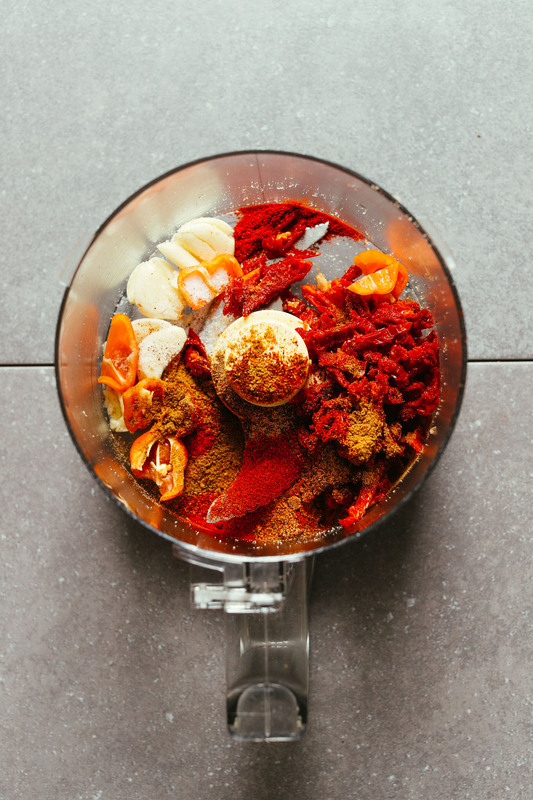 This recipe is definitely going to make including raw meals into my diet much easier. I paired this with the collard green burritos- amazing!! Thank you! This was amazing. I had to make do with tomatoes in oil – I patted them dry but figured it out. It makes quite a bit so I was eating it for days. I’ll definitely make it again!! What a wonderful recipe! I eat mostly fruits/veggies, but sometimes you need something akin to a cooked meal. This is it! My daughter shared this with me and uses lettuce in place of tortillas—made once a week. For my 1st time I used gluten-free tortillas, but will try lettuce next time because it was a little too heavy for me. I tweeked it a little—not having smoked paprika or peppers—so used a chipotle and pepper salsa instead. This was so amazing that even my picky, non-vegan husband really liked it! I don’t have many “keepers” but this is one. Thanks! Hi, I tried reading all the comments to see if this was already asked but there are a lot of comments. So sorry if I am repeating a already answered question. Are corn tortillas acceptable for a raw vegan? Just asking for a friend. I am a vegan not a raw vegan. Just want to make sure I do not give my friend something she is not going to eat. Thanks in advance! BTW looks yummy can’t wait to give this recipe a whirl! Technically masa harina isn’t raw because it’s soaked and cooked with an alkaline solution. Plus, in order to form them into tortillas that hold fillings, they need to be cooked. If you’re trying to do truly raw tacos, I’d suggest lettuce wraps! Made this for a work potluck. There are 3 other vegan/vegetarians in the office but to my happy surprise many people sampled this and they all loved it! They had no idea what the main ingredient was. :) This really is so yummy, and I heated it up gently in a pan to make the tacos warm. Making a big batch today for the week! Hello, I am new to the raw vegan life style and I am mainly doing it to get healthy and lose weight, according to my calorie counting app 3 cups of walnuts are a little over 2000 kcal which is too many for me at the moment. I understand that it’s healthy fats and provides good energy however, is there a lower calorie substitute I could use? I’ve had this recipe on my to-do list for a while now, and finally got round to making it last night. This is a home run recipe! I have loved every MB recipe I have made but this was the first one that I felt I needed to review. It was super easy, yummy, quick and versatile. My husband is not vegan and he loved it. It will be in our normal rotation and I shared with many friends. This looks great and can’t wait to try it, BUT…. did you know nuts have the highest levels of PHYTIC acid – which leaches out the nutrients in your body! Same deal as sugars and other carbs. That’s why the optimal diet consists of healthy meats, TONS of veggies and fruits, and minimal carbs. Nuts are very healthy don’t get me wrong, but they are meant to be consumed in very small batches. The founder of the American Dental Association found that tribes in Africa that never had cavities or got sick in general ate tiny portions of nuts (whatever they’d find and husk on their hunts), and lots of fruits and veggies. You want to feel like a million bucks and never get a cavity again? Cut out phytic acid. When the ‘taco meat’ is comprised of walnuts, I can’t help but think you might be better off with some red meat! I plan to make the recipe as follows and include it alongside the meat, reducing the meat intake as well as the nut. Looks great tho! This is SO flavorful! I used Jalapeno and 50/50 Ancho chili powder & regular chili powder. I finely diced zucchini, carrot, onion, bell pepper and tomato. Mixed it all together and put it in the dehydrator for 1.5 hours. It was amazing for taco salad. Even adding copious amounts of veggies didn’t take away from the flavor. We didn’t even need a dressing for the salads. Thanks for this staple recipe! Woot woot! Glad to hear it, Joanne! I made this, it was so delicious. I used it as a salad topping (with baby romaine, corn, and avocado) and used it again on a baked sweet potato with avocado. It is a tasty and easy protein to have in the fridge! This recipe is absolutely delicious!! I made it this evening for dinner as filling for corn tortillas, along with sautéed bell peppers, onions and melted vegan cheese, avocado and lime. The smoked paprika really adds a Mexican aroma and taste and the texture is fantastic. I can’t wait to make this for friends, vegan and meat eaters alike. This recipe is a real keeper! Yum! Thanks for sharing, Virginia! Just made this and my boyfriend and I loved it! He heated it up a bit along with the corn street taco tortillas. He browned the taco mix a bit which was great. I also had butter lettuce so I alternated between tortillas and lettuce wraps. I’ll be making this again and again! Yay! Glad you both enjoyed it, Ida! OMG who knew this would be SO DELICIOUS! Not surprised, of course, but I was worried about the 3 cups of walnuts. But, no! It tasted AMAZING! Please try this! We are so glad you enjoyed this recipe, Clare! Thanks so much for this recipe… for tacos which were absolutely delicious! We omitted the peppers, but found they were very flavourful! I have enjoyed making several other recipes and appreciate your efforts and sharing. Amazing flavor! Quick and easy! Two habaneros give the recipe a lot of heat! This recipe is a keeper! Thank you! Deeeeelish!!! Can’t believe how delicious this recipe is. Whoop! Glad to hear it, Melanie! I have been following your recipes for years!! You have the best combinations that always pack lots of flavor. I am a raw vegan and I look for ways to add more protein into my diet. This recipe was perfect. Thanks so much!! Not a huge fan of sun-dried tomatoes so I substituted with a small fresh tomato and it was delish! I incorporated this ‘meat’ in a layered dip and served it warm with tortilla chips. My husband and his friend were blown away. Thank you! Are you able to compare the texture of your pecan/cashew version to the walnut version? I made it as-written even though walnuts irritate my mouth (I guess I’m not full-on allergic, but they make my mouth and tongue burn). I was hoping it wouldn’t trigger that, but it did. But it was so delicious! I was a bit sad I couldn’t eat it in quantity. I recently made the recipe w/ walnuts because that’s all I had on hand, and I think the textures are very similar if not exactly the same! Holy s$&@! That’s what I thought when I took my first taste test! Wow! That’s spicy, chewy, flavorful, and crazy fast. I didn’t have sun dried tomatoes so I had to throw in some jarred salsa. No matter. Delicious! I’m going to try it with the sun dries tomatoes because i know Minimalist Baker recipes are best followed to a T! Thanks for such good healthy food! Yay! Thanks for sharing, Kristi! Your site is amazing! I’m vegetarian and looking for new foods to try, but I hate to cook. So this will be on my list to try this weekend. I can use this for dinner or lunch which makes for a great way to get others to see being vegetarian isn’t as bad as the think. I may try this for our next carry in! Thanks! I’m making this for dinner tonight, can’t wait, I do have a question though. You say the yeast is optional, but I’d like to know what it is for. Hi Loly! 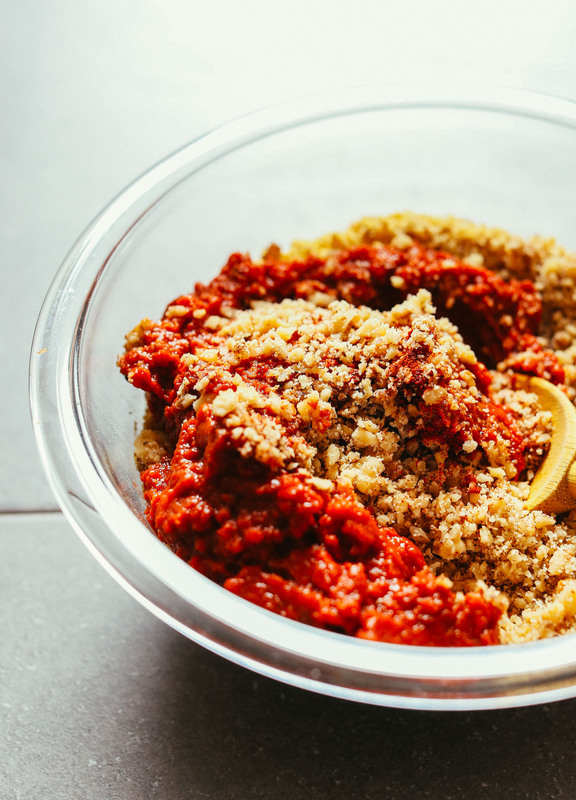 Nutritional yeast provides a nutty, cheesy flavor and is often used to emulate cheese in vegan dishes. Yay! Glad to hear it, Anne! Hello, Do you think it would be OK to soak the walnuts before I use them in this recipe or would that give it a funky texture? We tend to have some digestive issues if we don’t soak nuts first. I am thinking it might negatively affect the texture but I’m not really sure because I’ve never made something like this with soaked nuts before… I definitely don’t want to ruin 3 cups of organic walnuts and all these ingredients ? Thank you in advance! I wouldn’t recommend soaking them as it would change the overall texture of the recipe, Holly! You should be able to soak and then dry the nuts before using. I soak and dehydrate all my nuts and seeds for better digestibility. The nuts’ texture will be just the same after dehydrating them again. They will lose only the bitter aftertaste of the phytic acid, tannin and anti-digestive enzymes. I also gave this to my meat eating boyfriend and he loved it! It reminds me a bit of Chorizo. I made it in a corn tortilla with black beans and vegan mayo but really have been wanting to try the vegan sour cream recipe you have! So simple and enjoyable thank you Minimalist Baker! Yum! We are glad you and your boyfriend enjoyed it, Genevieve! This recipe is amazing. Super easy and delish! Rich and hearty-my husband and son raved and wanted seconds. This is so tasty! Even my omnivorous boyfriend thinks so! I subbed the chipotle pepper in adobo sauce for the habanero and it came out beautifully. This recipe is so versatile, we’ve used the leftovers in burrito bowls, burritos, and nachos! Thanks for sharing your subs, Rebecca! I think that could work, but we haven’t tried it ourselves! If you experiment with it, report back! Just made this and my husband and I both loved it! I am not a skilled person in the kitchen, but this was so easy and came together so quickly! We have been looking for a substitute for soy meat to use in tacos, salads, and other recipes, and this was perfect! My husband said it is his favorite “not meat meat” that we’ve tried ha! Thank you for this great recipe! This was delicious, we omitted the habanero because we didn’t have any on hand. It reminds of us the SunChorizo they have at Sun Cafe in Studio City. Hi Dana! Love your site and as I’m transitioning to a vegan diet I visit quite often. I did make this ALL WRONG and it came out so right!!! Two kids at home to keep me plenty distracted had me throw all ingredients into a food processor and pulse. What happened, after I almost cried from “wasting” all those beautiful sun-dried tomatoes, was an amazing rendition of your recipe. I added some cooked brown rice and black beans to the mix afterwards which was hearty and so flavorful that I had to write in! I’ve used it for tacos, added it to spaghetti squash with fire-roasted tomato sauce, and molded it like a veggie burger on a wonderfully soft wholewheat roll. It tastes even better after resting in the fridge for a day to allow all the spices to blend and the sun-dried tomatoes to re-hydrate a bit. I plan to try again according to the directions because yours looks saucy and sounds too good to pass over, but thought you might like the alternative too. Thanks for all your awesome food, looking forward to the next greatest thing, yum! Great recipe- approved by my boyfriend who is very much a meat eater. I unfortunately do not have a food processor, so I did it by hand. I am sure it is better with a food processor but mine turned out great even with chopping everything very small by hand. Smelled so good even while mixing it all up! I am not a vegetarian or a vegan, but after coming to this website from a duckduckgo search for making flax eggs, I poked around a bit, and this looked so tasty, I had to attempt it. Some of my walnuts didn’t chop up very small in the food processor before other portions were turning into a butter, so I stopped the processor and left the walnuts as they were, and continued with the recipe as written, only adding another 1/2 t salt. What can I say, I love salt! Anyway, this was delicious! I put a scoop on a lettuce leaf, added a slice of avocado, squeeze of fresh lime, 2 slices of tomato, and wow, what a treat! Looking forward to trying other recipes here. Thank you for sharing. Hi Dana, does it have to be coconut sugar or can I substitute a different kind of sugar? I would recommend using brown sugar in place of coconut sugar, or stevia if avoiding sugar! Holy crap this is so good! I halved the recipe because I realized I didn’t have enough walnuts and I used one jalapeño pepper since the store was sold out of other types (and I’m not a big spicy person anyway). I had to add more water to the sauce than I expected but it turned out perfect. Thanks, Dana! This will be a staple in my diet now! Hi! Sorry for the weird question, but this looks so good I have to ask. I have a strange aversion to the texture of nuts. But I love ground up nuts (smooth almond butter, almond paste YUM, blended cashew sauces). Do the walnuts in this stay kind of crunchy? Do they absorb the moisture from the sauce and become softer? Does it have the texture of seasoned taco beef or something else? Thanks to anyone who can answer. ? The walnuts because softer and absorb some of the liquid. That being said they still have texture. But are not crunchy like crunchy peanut butter. If you really want to try it I would suggest blending longer until the walnut chunchs are super small and start sticking together. I can’t guarantee anything though! Wow Dana this is amazing. Another great recipe! I only substituted two medium spicy chillies for the habanero. Thanks again. Made it. Loved it. Kids loved it. Husband loved it. (Pug looked at it longingly from beneath our patio table, but we didn’t share any with him.) Thank you! Wow, that was perfect and absolutely delicious! As always when I cook, I changed it a bit and it was so great! I had to take a lot more dried tomatoes (as they were soft and to get it into a good texture) and loved it! Woot woot! Glad to hear you enjoyed it, Ginger! I don’t have a food processor :/ Will a powerful blender work? I’m not sure it would work as well, but if you give it a try, just be sure to not over-blend! Yay! Glad to hear it, Amanda! I was trying to think of some words that would describe me dancing as I chewed this satisfying and delicious recipe but take my word for it, I did a little swerve and hip swirl… um um um. It is everything you described Dana. It was smoky and a little spicy (I didn’t have peppers, I used a scant amount of cayenne). This was another winner. Every one of your recipes has been a winner on my table. Thank you!! I made this for a taco bowl. Made the recipe tonight. Used 2 chilis in adobo sauce instead of habaneros. Need to grind the walnuts a bit finer than you think as I found the mixture a bit too coarse. I think you can tone down the cumin just a little. It takes longer than 10 minutes to pull this together, but under 30 minutes. This recipe makes a large batch. I had 3 tacos and have enough left for at least 6 more. Great flavors. Could see adding black beans and corn. Garnished with red onion, cilantro, avocado and cherry tomatoes. Just made this, and used siete cassava tortillas, avocado, and cilantro. Topped off with some hot sauce it was addicting and delicious!! I didn’t have chili powder, so I left that out and used 2 habaneros. Next time I will definitely add the chili powder but it was still SO good! I definitely used less than 1/2 cup per taco because I had 3 of them ????. W O W, It looked good on paper but tasted even better! Healthy, delicious and SO easy to make. It is the perfect summertime meal. Definitely a repeater. I made this for dinner tonight. Followed the recipe as written. My husband and I loved it! So flavorful, and So much much better than meat. If I were to cook it, I’d just sauté it in a pan for a few minutes until slightly browned. Hope that helps! Recipe request! The spicy vegan spread used on the avocado toast served at upper left coffee in portland! I’ve never been there but will add it to my list! Very yummy! I didn’t have enough walnuts so I subbed the remaining with almonds (that’s all I had). It was ok, next time, full walnut. Hi Dana! Absolutely delicious! My family loved it. I did not use the fresh chili pepper or garlic because my daughter-in-law can’t digest it so I just used the dried spices. I used sun-dried tomatoes that were in olive oil because that is what I had on hand. I drained the tomatoes and dried them with paper towels to get rid of the oil. I also had to add a lot more water to make the sauce. I made a lot of different condiments to go with the tacos,e.g., mango salsa, onion and cilantro salsa, lime wedges, sliced avocados and sautéed veggies. This dish is easy and delicious and I look forward to making it again. BTW, I love your recipes and am thankful I found your site 4 years ago when my husband and I became vegans. You have made cooking healthy flavorful meals so pleasurable and easy for us and I’m sure for many others like us. Thank you!! I made this with adjustments and it was still really good! I took out salt, replaced walnuts with cooked black beans, and half’d the whole recipe except the beans (walnut replacement). So spicy! I need to take out the habanero so my kids can eat it too. Should I just omit it?? Or do you have a substitute suggestion? Perfect hot day meal! Thanks! I just made a “test batch” so that, if I like it, I can prepare a BIG batch for my nieces wedding reception, a pot-luck taco bar. Well, I don’t just like it, I LOVE it. I do have to remind myself that it IS based on walnuts and so is not low-calorie, but it has the taste and texture and mouthfeel of our beef-based taco seasoning and should please all the vegans and vegetarians on the guest list. I used date nectar as my sweetener – just a little bit – and it does indeed balance the heat of the chipotles in adobo sauce (my choice of heat packing pepper). My other tweak was to eliminate the salt altogether. 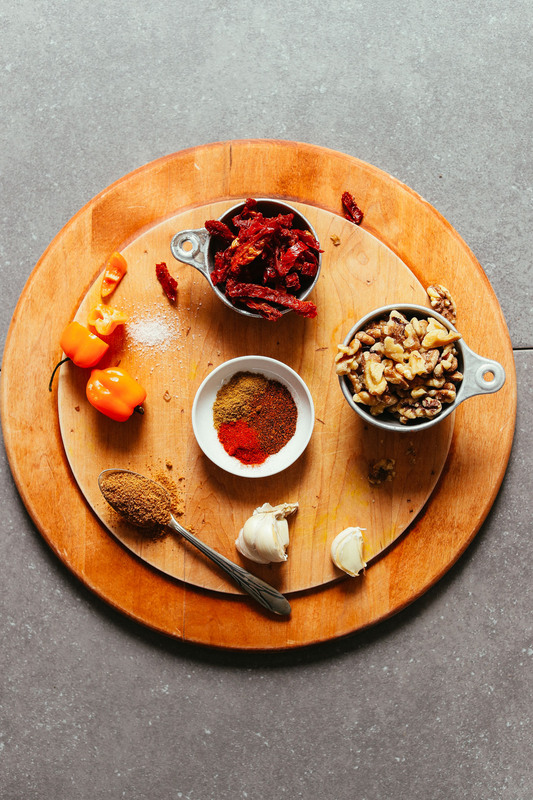 Between the chipotles and the sun-dried tomatoes, there’s more than enough sodium. These should be a huge hit! ps I meant to write that this dish has the taste and texture and mouthfeel of our usual beef-based taco FILLING (not seasoning). Can’t figure out how to edit my comment. Just made this deliciousness for lunch and it was outstanding! I did heat up the taco walnut mixture for a few minutes on low. I did not have radish on hand so I used bibb lettuce. This recipe is fantastic! Smart! Thanks for sharing (lovely name btw). This. was. delicious. And also so fast and simple. Thank you! Even my meat-eating husband loved them. Whole Foods was out of the sun-dried tomatoes that come in resealable baggies, so I had to make it with the oil-packed ones. I used less water; the world didn’t end. Yay! Glad you enjoyed this recipe, Jessica! I totally realize that this is a raw recipe but… Do you think you could heat this? Would the walnuts get too oily? I am not a fan of uncooked nuts in things like this, but I thought you could quickly sauté in a pan?? I think it would be awesome cooked in a skillet! What do you think about substituting walnuts with cashews? I’m allergic to walnuts. K, I’d recommend sunflower or pumpkin seeds or cashews, or even a blend of several nuts and seeds might work! Let us know what you try! This recipe looks delicious. Can’t wait to try, thanks for sharing. Dana, I hate asking this but I SO WANT TO TRY THIS! Any sub for tomatoes b/c of nightshade allergy? I know they add texture and alot of umami flavor here but I’ve been racking my brain trying to think of a good substitute because I think the spices will add so much flavor on their own that the recipe is not depend totally on the tomatoes. Any thoughts? He can eat bell peppers so maybe I’ll try that! Maybe the fire roasted ones in a jar. Do you think I should change anything else (like more seasoning) to accommodate this change in the recipe? Thanks Dana. I’ve made this several times (similar but not exact) in the past and can’t wait to try yours. Even the meat eating husband liked it! Hello Dana! Can I use other non spicy peppers to replace the habaneros to avoid the hot part? Thank you. You can use anything. I just use whatever is fresh in my garden! Or if you don’t like it hot, mini sweet peppers also work. Smart! Thanks for sharing, Kara. Can this be frozen and kept for awhile? Yep! We note in the recipe box that it should keep frozen up to 1 month. It says in the recipe, for one month. Thanks! Looking forward to trying this. I usually buy Morningstar crumbles to make tacos, sloppy joes, etc., but it’s loaded with salt. Right! Love this raw, fresh option. Anything you recommend as an alternative to walnuts? Maybe sunflower seeds? I’ve seen those in similar recipes. Thanks! I have tried similar recipes with pumpkin seeds and sunflower seeds and they turned out great! They should work well with this recipe too. So excited to try it Dana! Yes, Rena I’d guess sunflower or pumpkin seeds, or cashews, or even a blend of several nuts and seeds might work! Hi there! Fairly new to your site and am blown away! SO many things I want to make. Thank you for sharing all that you do! This recipe looks genius, what would you think about using lentils instead of walnuts or any other seed or nut? Welcome to the site, Lindsey! We’d recommend sunflower or pumpkin seeds or cashews, or even a blend of several nuts and seeds might work! Let us know what you try! Cauliflower is a good substitute with some seeds and nuts too. I made it with cauliflower and walnuts, so don’t see why seeds and nuts wouldn’t work. This looks so simple yet sooo yum! I was looking for an alternate to tofu and I think just found a winner! I was wondering what to do with all my walnuts… Perfect recipe! I’m looking forward to trying this as I’m trying to go meatless, and LOVE me some Tex-Mex.